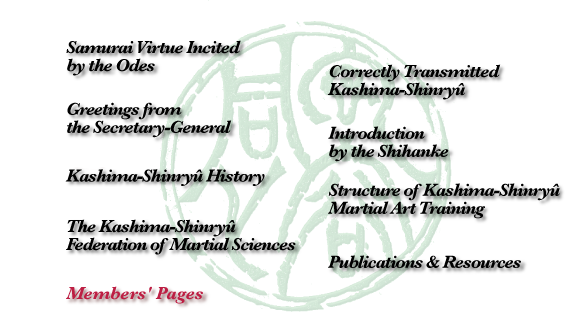 Official site of the Kashima-Shinryû Federation of Martial Sciences. The Kashima-Shinryû Federation of Martial Sciences (Kashima Shinryû Budô Renmei) was established by SEKI Humitake, the 19th generation shihanke (headmaster) of the Kashima-Shinryû and the person whom the 18th generation shihanke, KUNII Zen'ya selected as his documented successor. Operating with the full support of KUNII Masakatsu (the 19th generation and current sôke) it endeavors to maintain and develop the ideals and techniques of “Kashima-Shinryû in their original form as traditional Japanese culture.” The Japan Patent Office has officially recognized Kashima-Shinryû® as a Trademark (no. 5026637) owned by the current shihanke[*] . Accordingly this Federation is the sole body legally authorized to provide training, examinations, and licenses or diplomas in Kashima-Shinryû in conjunction with martial art activities of any form. To ensure that the orthodox martial way must be properly maintained, during the last 600 years all new members of Kashima-Shinryû ought to have followed the custom of presenting a written request for instruction (Kishômon) to the current shihanke (or sôke) in which they promise to adhere to certain rules. These rules forbid anyone from providing martial instruction without express written consent of the current shihanke. Monthly instruction fees, lecturer’s fees, or publishing rights also are forbidden. Nonetheless in recent years groups that lack proper qualification to offer martial instruction have expropriated the name “Kashima-Shinryû” and have offered lessons and publications on a commercial basis. Such activities infringe on the rights of this Federation and will be subject to appropriate legal remedies under trademark law. For a list of duly authorized chapters and instructors who have received proper certification from this Federation, click here.